Now that I have an iPad 2, I soon realized that I needed an iPad stand. Holding the little slab in your hand or laying it flat on your lap or a tabletop just doesn't cut it much of the time. The vast array of available iPad stands speaks to this need, and you should be able to find one that combines the perfect synergy of features and price to suit your particular needs and taste. 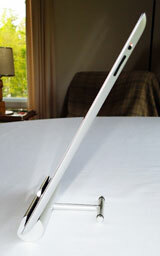 One compact iPad stand that is thematically consonant with Apple's design and materials conventions is the LapWorks iPad Space Dock, which is fabricated primarily out of anodized aluminum - a process analogically similar to Apple's unibody laptop construction, and matches the back of the iPad 2 nicely. 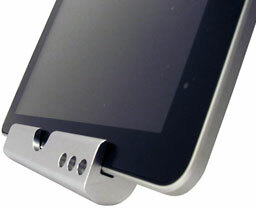 The Space Dock's main 6" long module is cut from a rod of solid aluminum and given a brushed aluminum finish. 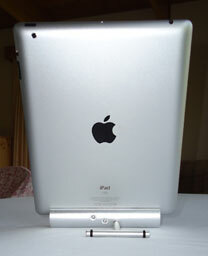 The Space Dock has to be one of the smallest iPad stands on the market, at 1-1/8" high and weighing in at just 10 ounces. However, it's still capable of securely supporting the iPad in both portrait and landscape orientations in its support channel, which comfortably accommodates either the iPad 1 or iPad 2. The Space Dock's inside support channel is lined with velvety material that holds the iPad comfortably and securely while protecting its surface from scratching, as well as rubbery pads on the bottom to keep the stand itself from scratching support surfaces. The Space Dock's T-shaped support arm threads into the back of the unit and extends out 2-5/8" rearward, providing ample stability and resistance against the iPad tipping backwards. 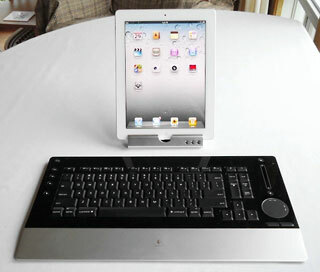 The SpaceDock can also be used in conjunction with a Bluetooth keyboard, like my Logitech DiNovo Edge, to create a mini desktop configuration for typing input. There are three different threaded holes for the support arm to thread into, supporting incline settings of 58°, 62°, and 66° from vertical. 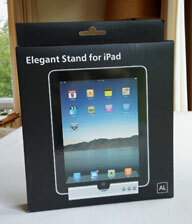 The three-hole theme is repeated on the front face of the stand, with that number of perforations to allow sound from the iPad 1's speaker to flow through unimpeded. The Space Dock's small footprint lets it fit in smaller spaces, for example kitchen counters or mantelpieces, allowing your iPad to serve as a digital photo frame on a bookshelf or, of course, on your desktop. I've found little to complain about with the Space Dock. 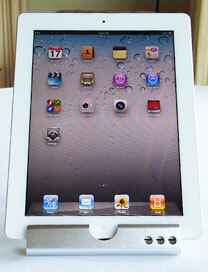 It supports my new iPad securely and is compact and light enough to easily pack around when you go mobile. The only niggle I've been able to identify is that if you tighten the support arm completely "home" in its threaded attachment holes, the crossbar ends up off a horizontal plane. Consequently, you're obliged to leave it about a fifth of a turn "loose". This causes no functional difficulties, and there is plenty of thread depth to ensure that it will securely stay put, but it bugs my sense of precision. The Space Dock's build quality and sophistication do cost a bit more; it lists for $64.95 but is currently on sale at $54.95. On the balance, the Space Dock is, like the iPad, elegantly simple in appearance, feel, materials, and design, and it should be extremely durable. I'll give it a 4 out of 5 rating, and it would've warranted a full five.